The opening weekend of the spring classics is less than 24 hours away so it’s time to inflict my take on the opening few weeks of the 2016 season on you. Omloop Het Nieuwsblad takes place tomorrow (the race that almost makes me want to find some dodge Sporza feed* on the ‘dark web’) followed my the arguably less interesting but certainly more accessible Kuurne Brussel Kuurne on Sunday. OHN seems (I say ‘seems’ as the proof is surely in actually being able to watch the race) to have the monopoly on drama and excitement whereas KBK has played out like an race staged as a benefit for Etixx (the erstwhile Omega Pharma Quick Step). OHN on the other hand has had two head to head finishes (in 2013 and 2014) and last year’s race where Etixx had a three to one advantage over Sky’s Ian Stannard and still couldn’t win. I haven’t studied the odds for a Stannard three-peat (he won in 2014 too) and I am so semi-detached at the moment that I can’t say for certain he’s even riding (he must be surely?) but if he does line up tomorrow Stannard is going to be marked like a Boonen or Cancellara. Forget winning the Ronde or Roubaix three wins on the bounce would be amazing under the circumstances. This could all play into Sky’s hands of course; Stannard is one of the least selfish riders in the peloton and I could imagine him playing with the race to allow a teammate a clear run. I had been wondering about this question after Wout Poels took the GC at the revived Volta a Valenciana at the beginning of the month. I had been taken a little by surprise as the early season pro-cycling fix is normally only provided by an post breakfast date with the Tour of Dubai on Eurosport. But there it was on the schedule and (confession time) I was less interested in who was racing but where they were. You see the Comunitat of Valencia is where Mrs VCSE and I have our main training ‘holiday’ and sure enough wasn’t one of the stages passing through with a few k’s of where we stay. Richie Porte – new team, same story? Anyway, my thoughts turned to Wout after he took the race lead early on with the first stage TT. Now Richie Porte was still around at Sky a year ago when Poels came on board but now Porte has switched to BMC there’s a potential vacancy as Sky’s forlorn hope for GC on the grand tours that Froomey doesn’t fancy. OK, so new signing Mikel Landa is supposed to be the shoe in to lead Sky at the Giro but might Poels turn out to be the more willing disciple of the Brailsford way? Poels wasn’t quite up to the job last week at the Ruta del Sol against a tougher field so he may yet remain cast as loyal water carrier for Froome but that Porte shaped hole remains and it’s not obvious to me yet that Landa is better equipped to fill it. Talking of Richie, his season is starting the way last years finished. There was a stage win in the Tour Down Under but that race is hardly an indicator of form for the year ahead. I might be doing him a huge disservice but for all that he is talking a good game I’m less convinced of Porte as a grand tour winner than I was a year ago. His teammate Tejay van Garderen might have been feeling a sense of deja vu also after losing the GC on the final day at the Ruta del Sol to Alejandro Valverde. BMC have the look of one of those expensively assembled football teams; full of talented individuals but not that good as a whole. Porte missed out in Oman to Vincenzo Nibali. The insight those of us attending the Cycling Podcast special at Foyles last week got was that Nibali had (something of a novelty apparently) trained ahead of Oman and as a result he’s in good form. If the rumours are true (and based on my evening at Foyles they may well be) Nibali will leave Astana at the end of this season so some early season victories may help adding the zeros to a new contract at a new team. One transfer that has paid off handsomely is Eddy Bos’s move from Sky to (the now) Dimension Data (ex MTN).Two stage wins in Oman and a top 10 GC finish goes nicely with last years win at the Tour of Britain. EBH was never my favourite rider at Sky as he just seemed to lack the final few percent but maybe he is another rider who didn’t quite fit the Sky mould. It must have been a helluva contract to for him to want to stick it out though when you look at the transformation a new team has made to him. Kristoff – too kwick for Kav? His new teammate Mark Cavendish shared a brace of wins with him in Qatar and the GC thanks to time bonuses. Where it counts however (for us armchair fans) is head to head with his (Cavendish) sprint rivals. We don’t have sight of whatever strategy Cavendish has for 2016; is it all about a gold medal in Rio? Against Kittel and Kristoff the statistic is currently one win only and the other two look like they are flying. So what do the early season outings tell us about how the rest of the year is going to shape up? Answer so far seems to be not (that) much. Chris Froome and Nairo Quintana have had pretty low key starts so we’ll have to wait until Paris Nice and Tirreno Adriatico (most likely the latter) to get a feel for what the grand tours might look like. It’s too early for the classics form to be settled either, with the notable exception that defending Ronde champion Kristoff looks strong already. The sprinter’s battle looks like it will be properly epic though with Kittel looking back to his best, the aforementioned Kristoff and a strong supporting cast with the likes of Ewan and Viviani to name but two. Cavendish might find the two K’s too much on the road this year but Viviani could end up putting a dent in his track hopes too. Christopher doesn’t like Vincenzo; he thinks that Vincenzo shouldn’t have ridden off when Christopher had a stone caught in his bike’s wheel. Vincenzo had a falling out with Christopher as he thought he was to blame for Vincenzo falling off with a lot of other riders. Then there’s Nairo. Nairo likes Christopher but thinks that he should have beaten him in a race that they had in France last month. In recent years the Vuelta a Espana seems to have become the grand tour for riders with scores to settle. In 2012 it was Alberto Contador’s first race back after his ban and last year the same rider went head to head with Chris Froome after their Tour de France appearances were curtailed by injury. Vincenzo Nibali is returning to the the land of his first grand tour win in 2010 but (also) where he was denied a ‘doble’ in 2013 when Chris Horner took an unheralded victory. Last year the Vuelta might not have truly been worthy of the title of ‘unofficial’ GC rider world championships but it was an awesome prelude to the real thing that took place in France in last month. This years Tour line up pitted all of the grand tour winners of recent years (bar Horner) and should have provided a definitive answer on who is (currently) the ‘greatest’. And yet the 2015 edition of the Vuelta will see the metaphorical “Did you spill my pint?” shenanigans continuing as Nibali attempts to prove that his 2014 Tour win was achieved on merit and Quintana seeks to demonstrate that he can outclimb Froome to win his second grand tour. Whoever triumphs in this contest, the question to see who is the ‘best’ will rumble on into another year. With Contador absent could Froome et al really claim to be the world’s #1 GC rider? Claiming that rider X is the ‘best’ rider is something of a red herring in reality. It would be more accurate to say rider X is the best rider now. Contador was arguably the strongest rider going into last years Tour and was superior to Froome when they met again in the Vuelta. He was able to continue that form into the Giro this year; almost winning the race single handedly. But by July he appeared fatigued and was certainly unable to respond when Froome attacked as early as stage 3. Froome, despite his second Tour win, may not be the favourite for the 2015 Vuelta. As I wrote here his victory was delivered on the back on early time gains on his opponents that were defended as the race went on. The appeal of a Tour / Vuelta double will be in the minds of Froome and the Sky team but I suspect that a win here would still take second place over a successful defence of the 2016 Tour. If you go purely on how he finished the Tour you would put your money on Quintana to win the Vuelta. If Alejandro Valverde reprises his super domestique role from the Tour I would shorten those odds further still. So what of Nibali. The lustre of his 2014 Tour victory had become very faded by the third week of this years race and was only partly salved by his stage win where he took advantage of Froome’s stone in wheel mishap. Astana bring Fabio Aru and Mikel Landa to the Vuelta and if the plan is to replicate the strategy that came so close to derailling Contatdor at the Giro Nibali could be a factor. The issue for the team in the Giro however was that the team leader (Aru) was off peak for much of the race. It doesn’t matter how well you can decimate the other GC teams if your leader can’t deliver the killer blow and that question mark will hang over Nibali as the race gets under way. Astana rider’s performance in the Vuelta may well be of more interest longer term as I think Nibali’s results will determine where he races in 2017 and with which team. Tejay van Garderen leads the second tier of GC riders to watch; returning after his DNF at the Tour. I don’t think we’ll see the BMC rider on the podium here but he could go well in the Andorra based stage 11 as he’s an experienced rider at altitude (he was winning the USA Pro Challenge this time last year and in 2013). Joaquim Rodriguez can claim that stage as his ‘local’ and quite a few people have tipped him to go well in the race. I’m less convinced; leaving aside the motivation factor that this is his home tour I just don’t think that Purito has the legs for victory in a three week stage race. Chris Froome wrapped up his second and Sky’s third Tour de France victory in four years on Sunday. While he was at pains to thank the contribution of his teammates and the wider backroom staff supporting the team Froome might also privately thank Nairo Quintana for his contribution that changed the narrative in the closing stages of the race. Even during the short period where he had worn the maillot jaune after his second place on the Mur de Huy, Froome had been assaulted by doping questions. Whether these were of the conventional nature asked during the post stage pressers or of a more accusatory nature hurled literally and figuratively from the ‘fans’ at the road side it felt at times as if any other discussion of the race had been drowned out by the arguments pro and anti Froome’s apparent dominance. Because his apparent superiority was just that. Quintana may have left it until the final two stages in the Alps to take time out of Froome but the final analysis showed that over the stages run in the mountains; Quintana had the fastest aggregate time. The reality of Chris Froome’s 2015 Tour de France win is that he won it in the first week and on the first day in the Pyrenees. The stage win at La Pierre Saint-Martin was almost a carbon copy of the first day in the mountains in 2013 at Ax Trois Domaines. Froome had nearly two minutes on Quintana going into the stage and took another minute out of him on stage 10. The damage to Quintana’s and the other GC contenders chances of victory had been done on a week earlier and hundreds of miles away on the windswept roads of the Dutch coast. I’ve admitted it already that I didn’t call things correctly as far as stage two was concerned and with hindsight it’s clear that the foundations of Froome and Sky’s victory were laid here. It was the start of a Tour nightmare for Vincenzo Nibali that plumbed the depths of lost time and suggestions that he should find a new team in 2016 until he woke up when Froome got a stone caught between brake pad and wheel rim on stage 19. Crucially, Zeeland was where Quintana lost two thirds of the time he was trying to make up on the yellow jersey for the final half of the race. So how did Chris Froome really win the 2015 Tour. The facts have little to do with allegations of doping and everything to do with a finely tuned team performance where everything was geared towards a Froome win. Lets start with team selection. Unlike the squad that won Sky’s first Tour win in 2012 there was no suggestion of dual aims. There was no sprinter selected in 2015. The team did appear to be neatly split between the best of Sky’s classics squad (Geraint Thomas, Luke Rowe and Ian Stannard) and a strong outfit of climbing domestiques including Froome’s close friends Richie Porte and Wout Poels. Of course no one really knew that Thomas was going to be quite so versatile that he would be mentioned as a possible podium late into the final week. Cast in the road captain role by Dave Brailsford as early as 2013 he was the ideal person to shepherd Froome through the first week that appeared to be designed to trip him up; wind, cobbles and narrow roads. In praising Thomas for a job incredibly well done as Froome’s shadow for much of the race it’s quite easy to lose sight of the fact that in all of the areas where Froome was supposed to struggle he actually thrived much of the time. While he remains vulnerable to self inflicted errors Froome had clearly decided that the best form of defence in week one was attack. With the ever present Thomas alongside Froome was already poised to take control of the race by the time of the first rest day with the first of the mountain stages to come. I had planned to write a short(ish) post ahead of the second full week of this year’s Tour on the speculation (confirmed by the rider himself yesterday) that Richie Porte would leave Team Sky at the end of the season. Ivan Basso opening the Tinkoff press conference with the news that he had been diagnosed with testicular cancer pushed possible Porte moves off the metaphorical VCSE ‘front page’. Getting the Basso announcement more or less hot off the press on my timeline I was disconcerted by my own (initial) reluctance to ‘say’ something on my own feeds. My immediate reaction, born out of my closest family having suffered was empathetic. No one deserves to suffer with this disease. Then I started to wonder. Basso is a rider with a ‘past’, part of the generation of pro cyclists that ‘competed’ when the doping arms race was at it’s height. How long would it be before people started to join the dots between today’s news; Basso; cancer and Lance. Having seen the very dignified way that he handled the press conference I’m glad that I didn’t think for too long about putting out my own (very small) message of support for Ivan Basso. The dots have been joined however. It’s perhaps only been 5% of the commentary, but it’s out there. If Lance’s cancer was caused by doping then could the same be true for Basso? The aptly named ‘Tin Foil Hat’ brigade thought that this was the story today. There has been a LOT written about Lance, his cancer and his doping. There has been a lot written about whether or not the former was brought about by the latter. I don’t think I have actually read anything conclusive in the many iterations of the Lance Armstrong morality tales that litter my bookshelf. I am something of a contrarian about doping. As much as I support a ban for anyone caught using PED’s I would equally advocate that it’s possible for a rider to return to the sport following said ban. I am more exercised by the misuse of TUE’s (an ongoing issue in the peloton) that I am about a confessed (and one hopes ex) doper riding and racing. Ivan Basso might represent the worst of pro cycling as someone who doped but there is (for me at least) much to be said for his subsequent repentance. Some might argue that he shouldn’t have been given the chance of a couple more years ‘in the sun’ with Tinkoff. Today’s news may bring about retirement sooner than expected but I hope that this isn’t the last we have seen of Ivan Basso on his bike. Why bother shelling out a tenner for 228 pages of official guide when you can get the VCSE lowdown on this years Tour for nothing? Last year we had Yorkshire. Everyone said it was going to be good; even me (although I added a typically English caveat; weather permitting). And the sun did shine and it seemed like anyone who had ever shown the slightest interest in riding a bike decided to find a spot by the roadside. I know, I was there. The grandest of Grand Departs has spawned its own three day stage race and made Utrecht’s job of hosting this years edition twice as hard. So why then as a (proud) Brit am I feeling a greater sense of anticipation ahead of this year’s Tour than last? While a lot of Brit fans were waiting to see who would be backing Froome over the next three weeks here in Essex we were looking to see if ‘our’ World Tour rider was going to France (via Holland). It’s easy to forget that Alex Dowsett’s ‘day job’, when he’s not breaking hour records is riding for Movistar. In the last couple of weeks the more eagle eyed among you might have spotted him on the flatter stages at Dauphine and the Route du Sud providing close protection for Alejandro Valverde and Nairo Quintana. I still suspect Dowsett smarted from his omission from the Movistar squad for last years race that would have passed through some very familiar Essex roads on stage 3. Poor health was cited at the time but other than the obvious home ties last year it was harder to see why he would have been selected. This year is a completely different story. Besides the ‘obvious’ item on his 2015 palmares, Dowsett took overall at the Bayern Rundfahrt and he’s coming off another national TT championship win. The opening stage prologue isn’t quite the quintessential ‘ten’ of the Brit club scene but I think Movistar have picked him to have a go at taking the jersey. It won’t be easy but other than Giant’s Tom Dumoulin I can’t think of another rider that stage 1 couldn’t have been better scripted for. ASO have tweaked the points allocation again this year and that should suit the ‘pure’ sprinters like Mark Cavendish and Nacer Bouhanni. The big blonde German elephant in the room though is the missing Marcel Kittel. Is it illness? Lack of form? There have even been suggestions that Kittel has succumbed to the cyclist’s illness; depression. Whatever the reason, the rider that looked set to dominate the bunch gallops is absent and that means that the metaphorical sprinters ‘crown’ is up for grabs. Of course Kittel’s absence doesn’t automatically mean that Cavendish will reclaim the number one spot. There’s as much depth among the fast men as there is in this years GC field. Let’s start with Alexander Kristoff. I posed the question of who could beat the Katusha rider after he claimed his second monument of his career by winning the Ronde earlier in the season. He’s been kept under wraps in the last few weeks (he didn’t contest his home championships) but you have to think he’s going to be tough to beat as it has felt at times as if all Kristoff has to do is turn up to a race in order to win. Not unlike a Mark Cavendish of old in fact. Cav looks like he’s in good touch too though; he rode an extremely untypical but nevertheless inspired solo effort in last weekends nationals in Lincoln. He looks as if he is peaking at the perfect time and isn’t July a good time to get your mojo back? Another rider who could lay claim to that is Peter Sagan. A rider who has had to endure a stream of motivational messages that his team owner shares with the wider social media audience and possibly the worst national champs kit of recent years could be forgiven for crumbling under the weight of a $15M salary and expectation in the classics. Sagan took the GC along with bagging a stage win or so at this years Tour of California going head to head with Cavendish and I would expect Sagan to have to take the points where he has the advantage over Cavendish (on primes etc.) if he’s serious about another green jersey. While it has been enjoyable to see Sagan in a place where he’s feeling like popping wheelies again I think this could be Kristoff’s year. I’m not as sure about the final showcase in Paris though; that one i’m giving to Cav. Enough already.. what about the GC? Dowsett in yellow. Kristoff v Cav. Mere aperitif’s to the main course that is this years GC battle. Last year we had Contador v Froome. This year we can add Nairo Quintana to the mix and that’s before we even mention last year’s winner Vincenzo Nibali. I’m sure someone has got the ‘stat’ that says when these four last raced against one another (together). Me? Haven’t a clue, but whenever that was a lot has changed not least that each rider is now a grand tour winner. Mark Cavendish doesn’t have a lot of time for armchair cycling commentators and even assuming that the Etixx Quick Step sprinter had stumbled upon this I don’t think it was just me that Cav was trying to prove a point to in Dubai at the start of this month. Cavendish took two stage wins and the overall GC in what was always likely to be another sprint fest on the Arabian Peninsula. Of course the win here won’t (read hasn’t) silenced the speculation over whether or not he can reclaim the throne from Marcel Kittel or, perhaps more importantly, earn another lucrative contract with his team. Even Patrick Lefevere is suggesting that Cavendish needs results if he wants to be re-signed by the erstwhile OPQS squad. Of course Kittel was absent from Dubai this year, so all bets are currently off over who has come into the season in better form, the key showdown likely to come at the Tour. However Lefevere indicated that Cavendish needed to perform in the early season races like this weekend’s Kuurne Brussel Kuurne and the first monument of 2015; Milan San Remo. The Belgian squad can’t change its spots as far as wins in the classics being the priority despite the investment in GC riders like Uran and emergence of Kwiatowski (admittedly no slouch in the one day races either). 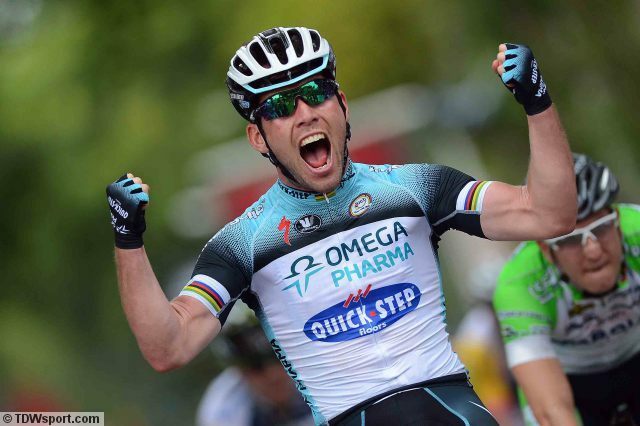 The impression I get is that a repeat of Cavendish’s 2009 MSR victory will be enough to ensure his continued employment with the potential size of his contract dictated by continuing that form into the summer. One of the riders that Cavendish will need to beat in MSR is Kittel’s teammate John Degenkolb. The Giant sprinter was the main threat to Cavendish on GC in Dubai and while the Manxman impressed with his 17th place on the one stage that offered an opportunity for the climbers, Degenkolb showed his versatility by scaling the steep sides of the Hatta Dam faster than Alejandro Valverde to take victory and briefly hold the overall lead. Giant have an abundance of sprinters, but it’s to their advantage that each of them bring something different to the party. Degenkolb can do the out and out bunch sprinter thing, even if he isn’t quite at the level of Kittel or Cavendish for outright speed. He’s emerging as a rider who is potentially more valuable in terms of world tour points however as he will be in the mix on (more than just) a pan flat sprinters stage and he can figure in one day races too. Even last year with his podium in Paris Roubaix and remaining at the sharp end on the Ronde until the last few km’s showed that Degenkolb could prove to be the more intriguing Giant sprinter to watch in 2015. The other take out for me in Dubai was Elia Viviani taking stage 2 and his first win in Sky colours. I think Viviani will be a great signing for Sky as they haven’t had a pure speed guy since Cavendish left. Of course it’s possible that Viviani will end up feeling just as frustrated as Cavendish if he’s selected for the Tour as Sky will be entirely focused on getting Chris Froome back into the yellow jersey, but if instead the Italian is picked for the Giro I expect he will claim wins. Sky also had Ben Swift in Dubai, but he’s morphed into a Degenkolb style rider and will be hoping to improve upon his third place at last years MSR. Most of the column inches will be given over to Bradley Wiggins tilt at Paris Roubaix this season and as much I would like to see Wiggins feature there I’m hoping that Swift is able to build on his return to form last year and get a big win in 2015. It was a shame that we didn’t get to see any of the action from the Tour of Oman this year. Since I started the blog I have enjoyed getting an early look at the grand tour contenders in what is the only one of the desert races that isn’t all flat stick racing. It’s often a good guide to form for the summer too, although Froome’s repeat win in 2014 ultimately didn’t guarantee a repeat in the Tour. Whether or not it was to do with the TV coverage this year (or lack of) the big names were absent from this years edition with Valverde and Tejay Van Garderen the pre-race favourites. Vincenzo Nibali was in Oman (and Dubai) but his presence has been decidedly low key and at this point his form is as much of a closed book as it was ahead of last years Tour. The eventual winner was Lampre’s Rafael Valls (no, me neither). Valls won the key stage with the summit finish on the Green Mountain from Van Garderen and this was enough to ensure the overall. From the VCSE sofa Valls looks like one of those riders who could be (infamously) described as ‘coming from nowhere’. He’s been with Lampre since Vacansoleil folded at the end of 2013 and this win is by far his biggest to date. Lampre, who didn’t exactly see much of a return on investment from Chris Horner last season and have finally parted company with perennial under achiever Damiano Cunego no doubt will wish Valls’ victory heralds the dawn of something big. If he does build on the result this could mean big things for Spanish cycling too as Alberto Contador is discussing retirement and Valverde isn’t getting any younger. It’s hard to say why there wasn’t at least a daily highlights package from Oman this year. Of the three desert races Dubai, the upstart, has by far and way the best coverage in so much as you can watch it live. The Tour of Oman is an ASO supported race and no less than Eddy Merckx is on hand to glad hand the press and yet it has been possible only to follow ‘live’ on social media in 2015. Oman doesn’t have the riches of Dubai (or Qatar) but surely it’s the quality of the racing that should take precedent as far as coverage is concerned? Oman’s demotion in the TV stakes is a bit of an uncomfortable example of what happens in a sport where there is (comparatively) little money around. If the future of the early season racing (at least as far as TV is concerned) is that armchair fans can only see the ‘action’ in Dubai because that’s where the money flows it will be a change for the worse. He got away with it; despite those pesky kids! (apologies for the Scooby Do reference). After losing out by a tyre’s width to Zdenek Stybar last week Philippe Gilbert finally managed to do what has so far eluded him this season and win something in the world champion’s rainbow jersey. Gilbert had shown real class last week by not having a dig at Stybar who hadn’t exactly worked for his win, so it did feel like there was some karma chi love in the air for the Belgian in Tarragona. Staying with the whole ‘curse’ theme, the guy that Gilbert beat to the line was erstwhile Norwegian champ Edvald Boasson Hagen. Sky, who give the impression of a team that have pretty much given up on sprinters have allocated (or should that be allowed) EBH a bit of a roving brief for the flatter stages at the Vuelta. This was also the case at the Tour and if the opportunity presents itself then Boasson Hagen can freelance a bit in search of a win. Gilbert of course had other ideas, but he needed to bury himself to first catch and then overhaul the Sky rider at the line. It says a lot about the last gap nature of the BMC team principal’s win that there were no time gaps shown for the first 40 riders over the line. 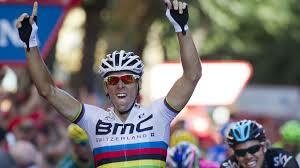 Philippe Gilbert’s win is probably one of the biggest victories that BMC will take this year. The team have shown more form in recent months with only Cadel Evans podium at the Giro as the early season highlight. Since the Tour we have seen a return to form for Thor Hushovd in addition to Taylor Phinney’s maiden win and Tejay van Garderen’s second US victory of the season at the USA Pro Challenge. Gilbert won a stage at last years Vuelta, the uphill finish to Montjuic in Barcelona and of course the world champs in Valkenburg offered a similar profile. BMC have thrown their efforts in this years race behind Gilbert and it’s clear that he is great form in Spain. In addition to last weeks near miss he also featured in yesterdays stage to Andorra finishing 15th having been in second place at one point on the final climb. There’s talk now of a possible defence of his world champions jersey but VCSE suspects the course will not suit him as much as current Vuelta leader Vincenzo Nilbali or Chris Froome. VCSE’s own curse of hyperbole struck this week as the racing has felt a little lacklustre after the excitement of the first week. A rest day followed by the individual TT probably didn’t help things. The TT saw Chris Horner lose the lead to Nibali again, although this time the Italian was happier about taking it over with the prospect of some heavy mountain stages at the weekend. Nibali rode a decent time trial as did GC rival Nico Roche who was a similar vein of confidence to Gilbert. Horner was the big loser on GC and while pre TT he might have seen the benefit of being able to see everyone else’s times on the stage itself he was the rider who was stopping everyone from being able to go home. Part of this was down to the contest for the win being decided by two riders well down on GC; Fabian Cancellara and Tony Martin. In the sparring between the rivals for the world TT champs this was a convincing victory for Cancellara. Although some are now questioning Martin’s solo break training ride as not quite the best practice for defending his world crown VCSE predicts that the German will probably hold sway in Italy. Friday’s stage was likely to be the sprinters last chance of a win before the race entered the high mountains. Unfortunately for them the peloton did not get organised in time to chase down a quality and numerous break away that included Bauke Mollema, Benet Intxausti and Michele Scarponi. Unfortunately for the break they seemed to forget just who and how many were in their escape and as the course wound its way through a series of bends on the way to the line Argos Shimano domestique Warren Barguil slipped off the front. As he dug for victory the remainder of the break were busy looking at one another and metaphorically saying “No.. I insist.. You go first..”. End result a win for the 21 year old Barguil. By the time Mollema and co’ had realised the error the damage was done and the victory sealed. The first of a double header of high mountain stages came on Saturday with the race due to cross the highest point of this years Vuelta over the Port de Envalira and into a summit finish in Andorra. Bad weather had closed in earlier than expected and Vincenzo Nibali was asked how he would cope. He described conditions “..like everyday in the Giro” but the stage took a heavy toll of riders with 14 abandoning including Cannondale’s Ivan Basso who was dropped and then succumbed to the cold. Such are the difficulties for the host broadcaster that much of what would have been seen as prime stage for TV was lost due to low cloud over the climbs, the Envalira being described to pictures from a fixed camera at the finish line. When live pictures were restored we were greeted by the prospect of a remarkable solo win by Cannondale rider Daniele Ratto. Just 23 Ratto joins the list of first time winners from this years Vuelta, that if nothing else highlight the unpredictable nature of the race. Ratto’s face was a picture as he crossed the line and savoured the win, particularly as he made the final kilometre look incredibly hard such was his exhaustion by this stage. Alejandro Valverde who had lost key lieutenant Pablo Lastras the day before was dropped at one stage but he staged an amazing fight back on the last climb that saw him overhaul many of his GC rivals who had been shelled, including Nico Roche. At the head of the leaders group it was Chris Horner and Vincenzo Nibali going toe to toe. At one stage Horner looked as if he could put some time into Nibali but as the line approached it was the Italian who was stronger gaining a time bonus as putting a couple of seconds into the American. Horner definitely had the appearance of the one who blinked first and with similar weather forecasted for today’s race it was going to be interesting to see if he had anything left to throw at the race leader. As it was the weather didn’t do much and the leaders played nicely with one another. With a finish across the border in France it was a French rider on a French team who took the win; FDJ’s Alexandre Geniez. After the televisual anticlimax of the previous days stage, today’s didn’t offer a lot of drama either. Nibali at this point seems to be only looking at Horner and it was interesting to hear the American interviewed confirming that he is more anxious about attacks from Joaquim Rodriguez and Valverde. Horner didn’t look troubled today, but neither did he look able to put in an attack that would unsettle Nibali. Nico Roche gained some time back on the stage and is now a few seconds of 5th after tumbling out of his podium place yesterday. As the race enters its final week there’s another day to come in the Pyrenees before the second and final rest day. The penultimate stage on Saturday on the Angliru may yet perform the task that the race organisers always wish and decide who ultimately wins the 2013 Vuelta a Espana. A moment of clarity while watching the USA Pro Challenge this week; could the US hold a ‘fourth’ grand tour? 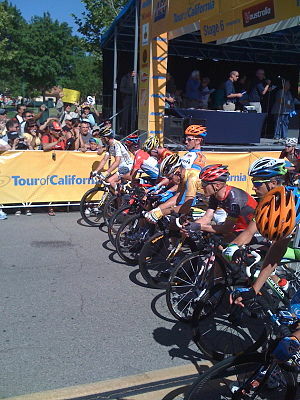 Let’s deal straight away with the Tour of California. Now VCSE doesn’t think that the TOC refers to itself any more as the ‘fourth grand tour’, but it was certainly touted as such when the race was born a few years back. Even the organisers (the ASO are heavily involved too) have realised that particular joke (they weren’t joking) isn’t funny anymore and the grand tour nomenclature has slipped quietly from view. This isn’t to say that California doesn’t possess some great roads to race over. This years parcours was no exception and the decision to race from south to north in the state paid dividends as far as the weather was concerned too. For a race supposedly taking place in the sunshine state, previous editions run in the opposite direction have often been subject to the kind of weather we would expect in northern Europe.. in winter! Delusions of (literal) grandeur have not been the only thing stacked against the TOC ambitious marketing. An obvious issue is that the race is a week long only; perhaps more Paris Nice than Tour de France. The TOC could reasonably describe itself as the second ‘race to the sun’. The key point is that what makes a grand tour grand is its length and the distance involved predicates a route that covers a whole country rather than one US state. California as evidenced by its changing scenery is bigger than many countries, but the US is bigger still and this is what provides a challenge but also perhaps an opportunity for that fourth grand tour. There are more stage races in the US than the two that appear on this years UCI World Calendar; the TOC and the USA Pro Challenge. The latter takes place days after another week long stage race the Tour of Utah. For the sake of argument lets say that a case could be made for combining the TOC on the west coast and the USAPC in Colarado. Both races currently take in mountain and sprint stages and can feature TT and summit finishes very easily. Run over two weeks rather than one or stretched into a third week with rest / transfer days and additional stages in each state it’s not such a great leap of imagination to see that of all places the US is best placed to deliver a genuine grand tour status event, rather than an over ambitious marketing claim. From an infrastructure perspective it’s hard to imagine a country better equipped to transfer riders and teams from one state to another. While host TV coverage is often characterised by its hyperbole it has to be said that the timings and on screen information often exceeds that of the other races on the world tour (Tour of Poland time gaps anyone?). Provided there is no interference on the satellite feed (Tour of Utah is a good example of this) the HD quality of the US races is generally superb also. The final ‘tick’ in the box for VCSE is the racing. The US continental teams at the TOC and the USAPC are always motivated to race and more importantly win. There was a genuine possibility of a US based team winning the TOC this year. OK, so having this and that team ‘presented by’ so and so doesn’t exactly trip off the tongue, but these teams are producing riders who are capable of moving up to a world tour team. There a more riders like Joe Dombrowski, a Sky neo pro this year after riding with US conti outfit Bontrager last year than journeymen in the peloton. Even the US riders who for obvious reasons return home for these events are super motivated to race hard. If you hadn’t watched the US stage races this year you would have thought that the highlight of Tejay Van Garderen’s year was getting beaten on Alpe d’Huez in the Tour. At home he has looked if not super strong, then definitely the most consistent GC rider, although he totally buried himself to with the uphill TT in the USAPC last week. Money is a huge consideration even looking at a week long event, but these US races are a marketeers dream for any bike manufacturer. The fans cannot get enough of riders like Jens Voight and Peter Sagan and it seems like a safe bet to suggest that a two week race would provide many more opportunities to promote your wares. Timing could be the biggest stumbling block. The TOC overlaps with the Giro and the USAPC front ends the Vuelta. It feels like the right time to schedule a two week race would be around the time of the Tour of Utah / USAPC as this would at least guarantee the weather. ASO having a foot in both camps as far as the TOC and the Vuelta are concerned could actually turn out to be a good thing in terms of scheduling. Consider the riders not at the Vuelta who could have starred in a two week ‘Tour of the Wild West’. Froome, Porte, Sagan, Rogers, Millar, Schleck, Van Garderen and Voight. With proto grand tour status it’s hard to dispute that more world tour teams would be in attendance swelling the ranks of top pros further. The somewhat fragile nature of cycling economics will probably mean it will never happen. VCSE would rather see additional investment from the likes of ASO and the teams going into funding expansion of women’s professional cycling. However this does feel like an idea that could take off purely on the marketing potential for the bike manufacturers and the chance for the US television networks to sustain the interest that spikes with the Tour in July. Will there be a fourth grand tour and will it be held in the US. Perhaps it’s not such a daft idea.